Our 10th anniversary was coming up. We didn&apos;t want to sit on a beach because we live near one. We didn&apos;t want to visit a floating city either, but we wanted to see the Caribbean. I remember the Barefoot Cruise days that I dreamed about doing. 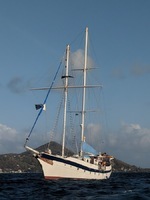 A quick internet search took me to Island Windjammers. I was sold and so was my hubby. We&apos;ve just arrived home yesterday from the excursion of a lifetime. My husband and I really didn&apos;t know what to expect. No matter how hard we would have tried, we could not have guessed at all the amazing moments this cruise would have. The crew was amazing with everyone always helpful to us and to each other. Even the captain would offer to fill our coffee cups when he was getting his morning brew! No smiles were spared! 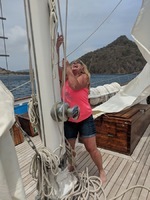 The range of activities - island hopping from the tiniest (Umbrella Island and Happy Island) to touring Bequia, from snorkeling to island tours, and even just relaxing aboard the ship with a rum punch and a good book - everything was amazing. 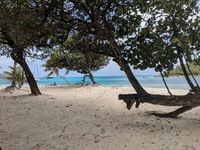 From the mast in the full moon to catching a barracuda off the ship to watching a sting ray lazily swim along the shore in the Tobago Cays, there was a surprise around every corner. We are already trying to figure out when we can go again and which of our friends can join us! Our 10th anniversary was coming up. We didn&apos;t want to sit on a beach because we live near one. We didn&apos;t want to visit a floating city either, but we wanted to see the Caribbean. 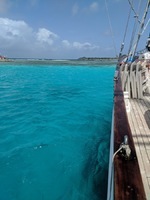 I remember the Barefoot Cruise days that I dreamed about doing. A quick internet search took me to Island Windjammers. I was sold and so was my hubby. We&apos;ve just arrived home yesterday from the excursion of a lifetime. My husband and I really didn&apos;t know what to expect. No matter how hard we would have tried, we could not have guessed at all the amazing moments this cruise would have. The crew was amazing with everyone always helpful to us and to each other. Even the captain would offer to fill our coffee cups when he was getting his morning brew! No smiles were spared! 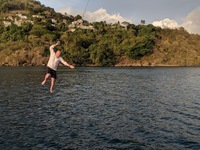 The range of activities - island hopping from the tiniest (Umbrella Island and Happy Island) to touring Bequia, from snorkeling to island tours, and even just relaxing aboard the ship with a rum punch and a good book - everything was amazing. 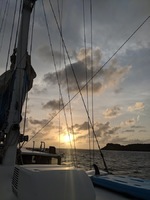 From the mast in the full moon to catching a barracuda off the ship to watching a sting ray lazily swim along the shore in the Tobago Cays, there was a surprise around every corner. We are already trying to figure out when we can go again and which of our friends can join us! It&apos;s a 101-ft schooner. The cabin was not large but spacious enough to not be claustrophobic. The bathroom was not too small with a separate shower stall, sink, and toilet. Our bunk was quite comfy and there were lots of nooks and crannies to be able to unpack and feel like you were at home...on a schooner. 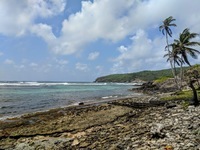 The island is delightful, as was Andre our tour guide who had extensive knowledge of the island&apos;s history and culture and a great network of friends that greeted us at each visit!